Notemate tool creates meeting docs before scheduled events and posts link to the team communication channel. It automates the process of regular sync events: standups, plannings, retros, etc. Setup event recurrence and notes will be created automatically. Define Templates using Markdown or HTML markup to provide document structure. All meeting docs are organized into the folders automatically. So humans don’t mess it up. Connect to Google Drive, Confluence to store documents. Post links to team's Slack channel. Just choose the document storage (Confluence or GDrive), define document template, set Slack channel and recurrence schedule. 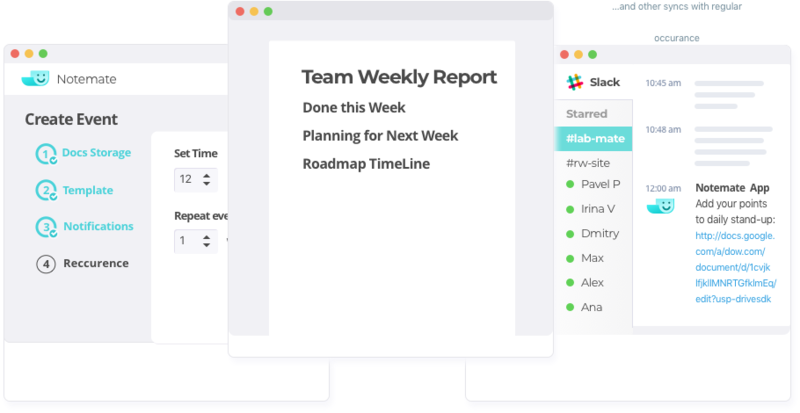 Then NoteMate creates document and post links to Slack, so your team gets prepared notes structure before event starts. Wether you are in Software Development, Business Development, Financial or Operational Teams, Notemate will help you organize your notes and save good piece of time by automating documents creation. As lead of distributed team I find this tool really useful! Notemate allows me and my team to be better prepared to regular meetings. It saves quite a lot of time during my daily work. No other tool can make this work and prepare event documents in our Confluence space. Remove hustle of unstructured meetings. Save more productive time for you and your team with NoteMate! Railsware is a leading Ruby on Rails company which provides contracting and consulting services around the world. Our development shop is among premium ruby on rails companies on the US market and our ROR development company is an expert in Ruby, Rails, HTML 5, and CSS3.